BOOKISH: Slowed to Sip Tea on Tatami: The novel is called "Kokoro"
Kokoro. It means heart in Japanese. 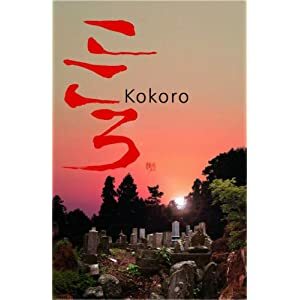 Like Haruki Murakami and even more so like Yasunari Kawabata (Snow Country), reading Kokoro takes you into an Eastern frame of mind. This is perhaps a trite thing to say, but it is true. And like Kawabata, who won the Nobel Prize for Literature, Soseki, who died in 1912, is from another time, and in writing about a Japan that is more than 100 years old we get one of those deepest pleasures that only the intimacy of reading stories can bring: we are taken back to that other time, that other place. Slowed to sip tea on tatami mats in open old Japanese houses on hot summer eves. Just that. It's almost enough. For the young man, the story's narrator, who so often seems to just kneel on tatami mats and wait, waiting to know the truth. For the wife, the one who is to pour the hot tea, who holds back so much of what she is thinking. This is Meiji Era Japan, a Japan that had only just began to open its doors again to the world, a place so profoundly unique and not that ready to change. Here, in these pages, no one is rushing toward anything else. The Tokyo noise described in the book is the noise of horse-drawn carriages and slow running trams. To get away from the big city to be by the sea, as the narrator does at the story's start, we feel as if the waves of that ocean never hurry to wash their way up the shore. The woeful pain at the heart of this intense story, it too takes its time to be revealed. The writing is simple and sparse. The tone is one of great patience, of care - it is, in the writing and thus the reading of each word, each line, the idyllic sense of what it means to be Japanese. Soseki's Meiji era Japan is a world so lightly drawn. That wonderful kind of writing that hardly seems descriptive and yet is so powerfully evocative. It makes me think of Hemingway. I should reverse that. It should go the other way (at least in terms of chronology). I don't know that Hemingway had access to Japanese texts, but like the Impressionists who could not have existed were it not for the Japanese art prints that influenced them, somehow there seems a connection between one of American's greatest writers and Japan. One critic compared Hemingway's prose to that of the Japanese haiku. That sparse, evocative style. A style so deeply inside writers as varied as Haruki Murkami, Raymond Chandler and also Raymond Carver. How can a story be sad without being depressing? I once read (and perhaps even blogged about) a reaction Sean Penn had to seeing a piece of Hollywood fluff. He talked of how high he'd been lifted up by the movie and then the terrible drop that came after he was forced to return to the real world. He swore to stop seeing movies of that kind from that moment on. In a similar vein, I often find that the best "sad" stories are the ones that most honestly ease the suffering in my soul. Suffering: a Buddhist notion. Certainly one that pervades much of Japanese art. Kokoro is not a book that takes you from the world; rather, it draws you deeper inside of it. Even if you don't luxuriate in a perfect sentence or a remarkable economy of storytelling, to be taken back to a different era, to a far off land; this book takes you to that other place, the place we've wanted to fly to since we were little kids begging our parents for just one more story. But Kokoro is no fantasy. It is that more intense kind of literary reality. It is considered Soseki's masterpiece, one of the great books of modern Japanese literature, and for good reason.